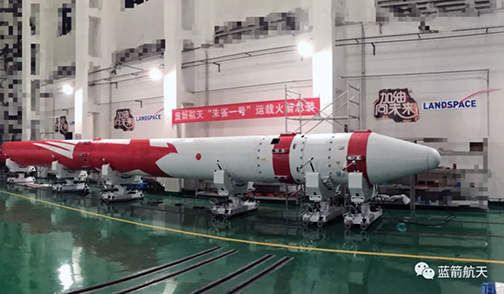 The assembly of the Landspace Zhuque-1 three-stage, solid-fueled launch vehicle in August of 2018. Photo is courtesy of Landspace. Zhuque-1 was expected to launch in the final quarter of 2018, with liftoff now looking likely to occur in October. Aboard will be a small satellite named Future (Weilai-1) for China Central Television (CCTV), which will carry out remote sensing and feature in a TV show. Zhuque-1 is a 19-metre-tall, 1.35 meter in diameter, three-stage rocket with a takeoff mass of 27 metric tons, producing thrust of 45 tons, making the rocket capable of lifting 200 kg. to 500 km. SSO and 300 kg. to a 300 km. LEO payloads. According to Chinese state media, the rocket will be launched from the Jiuquan Satellite Launch Centre in northwest China. In September, another company, OneSpace, will launch the first private suborbital rocket from Jiuquan, following its debut launch in May from a site in northwest China.